Lets start with the basics what is wheel alignment? Wheel alignment in basic form is the angles of the wheels so they are Parallel to each other and vertical with the ground. If the alignment of the wheel were not correct excessive tyre wear and poor road handling can occur. It is important to have your wheel alignment checked regularly and it is adjustable on almost all vehicles. We recommend checking the alignment once a year to make sure the steering geometry is within the manufacturers specifications. Potholes, nudging kerbs and road and wear in the steering and suspension components can all lead to the wheel alignment needing adjustment its all part of the maintenance of a vehicle. In most cases having a good inspection at the tyres that have been on a car for a while will normally show if an alignment and steering/suspension check is required. If the tyres are too worn you may need a new set check out the tyres page. We have a state of the art Corghi wheel alignment machine in our Wangaratta motor mechanic workshop, that allows us to check all the angles described below and more in some cases. The computer calculates the angles on each wheel and informs the mechanic which angles require adjustment. Once the necessary adjustments have been carried out by the mechanic the results are printed. The results page show the before adjustment angles and the after adjustment angles to show you exactly what we have done and we are here to answer any questions you may have regarding your wheel alignment and your results. There are several angles checked on a wheel alignment i will explain the most common used on today’s cars. 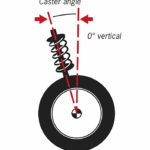 Caster is the angle of the steering axis.If you look at the side of the vehicle, draw an imaginary line drawn between the centres of the upper and lower ball joints and this will form an angle with true vertical; this is defined as caster. Caster can be adjusted on some cars but is not always an option supplied by the manufacturer. If you stand at the front of the vehicle, the camber angle describes the inward or outward tilt of the tyre. If the top of the tyre is tilted outwards that shows positive camber and if the top of the tyre is tilted inwards it shows negative camber. The camber adjustment allows an adjustment to be made to allow as much of the tyre surface to be touching the road as possible. Camber is the one adjustment that can be set according to driving habits. Generally, if you drive more aggressively when cornering, more negative camber can be set. If you drive on highways and do very little hard cornering, more positive camber can be set. At Williams Auto we set all angles to the manufacturers specifications. Imagine you were standing above the vehicle, the toe measurement shows whether the fronts of the tyres are closer (toe-in) or farther apart (toe-out) than the rears of the tyres. Toe specification are slightly different depending on if the car is front of rear wheel drive. If the car is front wheel drive the front wheels try to pull toward each other when the vehicle is in motion so the setting is normally a small amount of toe out. A rear wheel drive vehicle works in the opposite way normally requiring a small amount of toe-in. Normally all four tyres should be around the 0mm (give or take a few mm) mark and pointing straight forward meaning the front of the tyres are the same measurement as the backs of the tyres. Incorrect Toe is the one measurement that is very often the culprit of tyres worn on one of the two edges.